We threw all caution and calorie counting to the wind upon entering historic Hamilton Hall on Friday night. The reason? 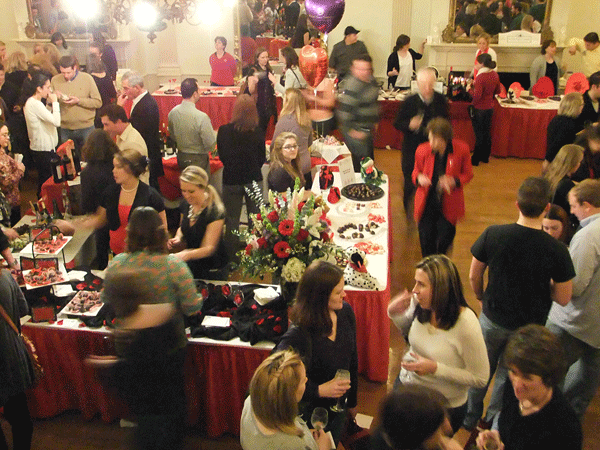 The 9th Annual Chocolate and Wine Tasting, the kick-off event for Salem’s yearly Chocolate and Ice Sculpture Festival, running through the 14th. We had a terrific time at the tasting, getting to see old friends and make a few new ones while sipping and nibbling our way across the room. The participating restaurants went all out with beautiful displays and an insane amount of sweets. We can’t even begin to mention everything we tasted. Coven had an impressive table stacked with huge, beautiful chocolate cupcakes. 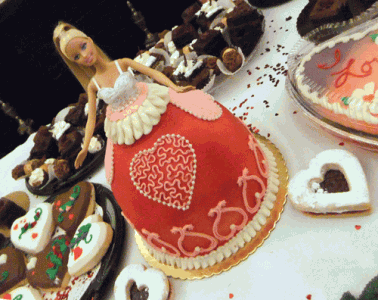 Coffee Time Bake Shop offered vast array of luscious baked goods, presided over by a fabulous Barbie cake that induced pangs of nostalgia. (My mother used to make them!) Those that stopped by Ye Olde Pepper Company‘s table were urged to choose chocolates from the largest heart-shaped box we’ve ever seen. 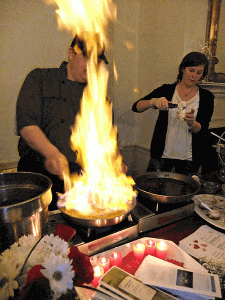 We got a kick out Chef John Andrews of Victoria Station playing with fire as he expertly flambeed cherries for a tasty dessert, and we chatted with Chef Steve from the Regatta Pub at Salem Waterfront Hotel & Suites (one of the event sponsors) about his hand-made truffles. They were all rich and decadent, but our favorites were the ginger and cayenne,both set off nicely by the bubbly being poured at their table. Speaking of cayenne, we really enjoyed the Caliente Cafe cocktail the ladies of Finz were serving. 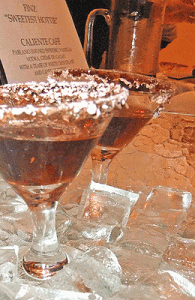 Made with pablano-infused espresso, vanilla vodka, and creme de cacao and then rimmed with white chocolate and cayenne, it had a spicy zing but wasn’t too sweet. Some of the wines that stood out were a vegan Malbec being poured by the Gulu-Gulu Cafe and the fun Apothic Red on sample from both Victoria Station and Busa Wines. It was lush and spicy yet smooth, a perfect companion to the chocolate we were consuming. Ian from Isaak’s of Salem was on hand pouring his Popp Road Raspberry, which paired nicely with the chocolate cake being served by Green Land Cafe. We also caught up with Sharon Driscoll, owner of Milk and Honey, who was scooping ice cream. She reminded us that as part of the festival, the green grocer is running a great special—20% off all products with chocolate listed in the ingredients. In fact, that’s just one example of the tasty specials available throughout the festival. For a full listing of events and savings, pick up a brochure or check out the Salem Chamber of Commerce website. 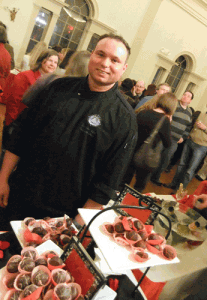 Even if you missed Friday night’s event, there are still plenty of opportunities to savor Salem. With fabulous ice sculptures and sweet deals, it’s the perfect date destination for Valentine’s Day.